Theatre is a world unlike any other. I got a glimpse of this in high school, a daily dose in college, and for the past six weeks I've been drinking this truth from a fire hydrant. 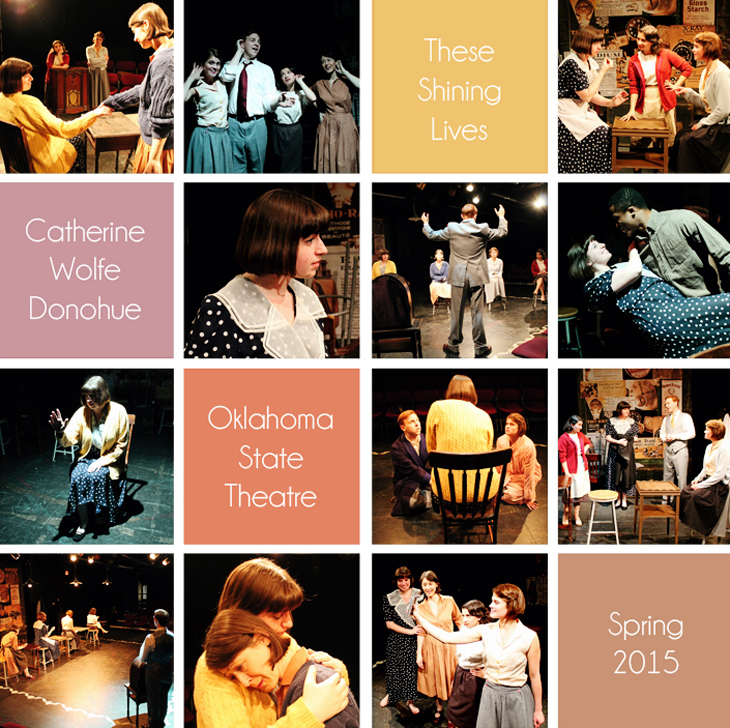 Back in October, I put my BFA in Theatre Performance to good use and auditioned for a show called These Shining Lives. Much to my surprise and delight I was cast in the lead role of Catherine Wolfe Donohue, a young wife and mother who gets her first full time job at the Radium Dial Company where her life is forever changed. The thrill of this role was getting to tell the story of the real women who left their mark on history. They paved the way for company regulations and who spoke out against the big businesses that threw away their workers for the product they made, getting away with it for far too long. When these woman contracted radium poisoning, they fought back, and they fought to the death. Catherine won her case after a 7 year law suit and died three weeks later. This is the largest role I have had to date, and one of my favorite plays I've ever worked on. I stage managed it during undergrad and tossed the script into the "to direct" pile, my mind full of expectations and ideas for a future production. Little did I know I would step into Catherine's shoes three years later on the performance side instead of behind the scenes. Having had a director's mindset brought its own set of challenges to the process. I had to let go of my view in favor of someone else's, bringing what I had to the table and accepting it when my director had a different take. Catherine goes on a rather emotional and physical journey throughout the show. When we first meet her, she introduces us to her world from the outside, from the other side. "This isn't a fairytale, though it starts like one," she says. "It's not a tragedy, though it ends like one," she adds quickly. It's an uphill battle, a learning process, and told oh so poetically. She begins as a bright-eyed and hopeful nineteen-year-old off to her first day of work, then must find her place in a gaggle of girls who have worked at the factory for years, watching her family adjust to this new phenomenon of the working mother. A few years later, things begin to go sour. The dust from the paint she works with is no longer a light shimmer that lingers on her fingernails and dresses, but her skin glows from within. Aches and pains settle in, and the company doctor won't tell her what's wrong. She and the other girls are fired from the company when they all become ill, and they must choose to suffer quietly or go down swinging. After losing a bet, Catherine must decide, and it's off to court they go. During one rehearsal, I commented that I avoid conflict at all cost. I don't have the guts to stand up like Catherine did; she calls out her boss for the truth behind the matter and presses on even when her health leaves her bedridden and under scrutiny from her hometown and the media. She has such a conviction, a determination, to fight for what's right no matter the cost. That's something I wish I had more of. At the end of the play, spoiler alert, we see her again as we did in the beginning. After all is said and done, after her life has faded away, we see Catherine on the other side. Her first words? "There is a God..." She goes on to speak of miracles and angels and her perspective on all that has happened. With a laugh she says, "I think lucky me that I still believe in it all, after all of this." Oh man. What truth! What hope! After all the pain and suffering and injustice she faced, leaving this world well before her time, she still believed. She still hoped. She fought for something greater than herself. I want to be that kind of woman. I want to stand in front of my Creator at the end of my days and say that I believed and I served with everything I had. I want to tell meaningful stories. I want to encourage others as they journey through their own. I want to act justly, walk humbly, and love mercy. I want to leave an impact, even if my name never hits the papers. And I thank These Shining Lives for reminding me of that. It always surprises me what I learn about myself and my heart when making theatre. Journeying through love and loss in someone else's life reveals the places where I am building walls or nurturing old hurts or planting new dreams in my own. So as hard and overwhelming and emotionally exhausting I might be at the end of the day, I know the passion for this kind of storytelling and art-making is from the Lord. I can't wait to see what's up next. One of my new favorite sayings is by Lara Casey: "There is nothing magical about January 1st." I've been using Lara's PowerSheets for over a year to help in my goal setting process and this year I've adopted her way of thinking. My January 1st is February 1st. 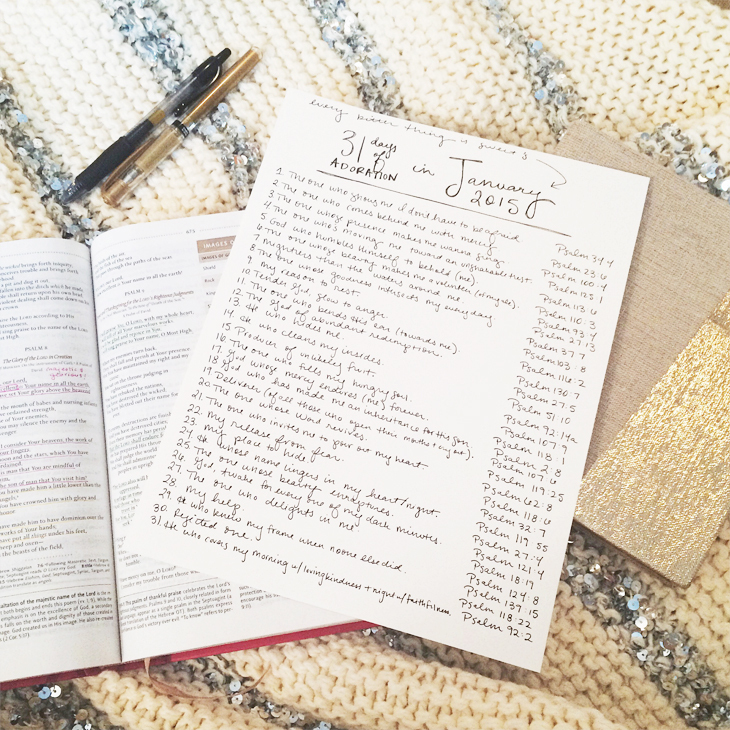 This is my first list of monthly goals of 2015 and I look forward to seeing the progress not perfection. 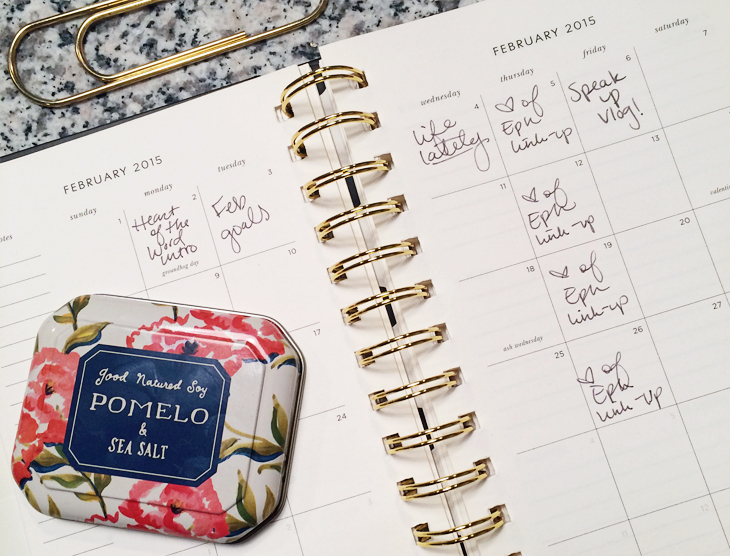 Above is a glimpse into my blog calendar for this month (and my new favorite candle from Anthropologie!) and I have to say I am especially excited for the weekly link up with #heartofEphesians. Read more about it in yesterday's post. 1. 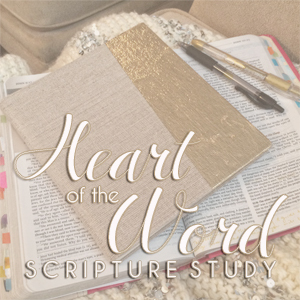 Introduce + co-host #heartoftheWord study on Ephesians. 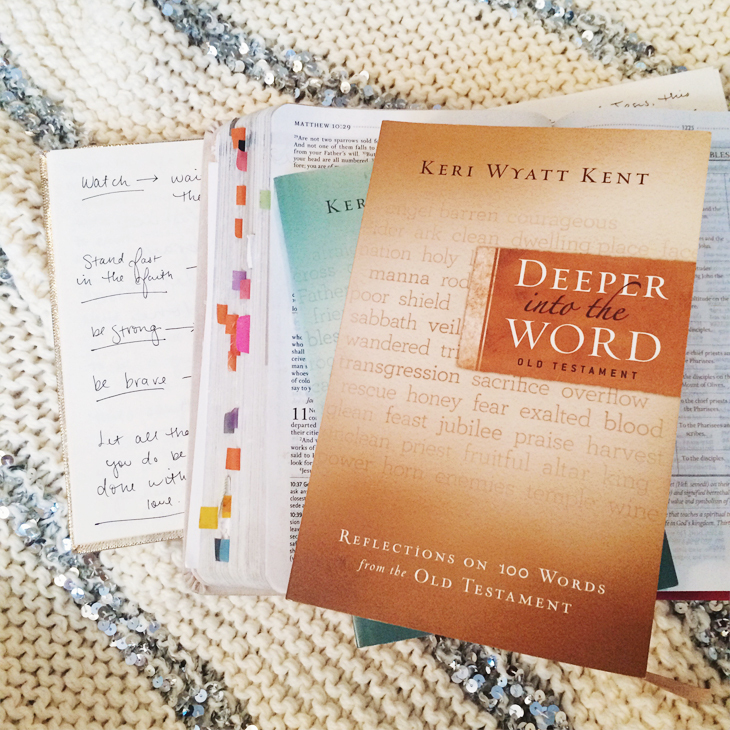 We launched #heartoftheWord yesterday, and I'm already learning SO much from this study. Won't you join us? 2. Perform These Shining Lives with my whole heart. My show opens one week from Thursday. I'm excited to share our story with an audience and see our hard work come to life. 3. Finalize spring break plans. I have a few ideas up my sleeve but I want to nail down the specifics before February comes to an end. I can't wait for a few days off and the chance to see dear friends. 4. Get rid of the excess/donate a few boxes. I started the process of sorting through my closet and boxes, and my trunk is full of items to go, but I want to make another pass through to simplify. 5. Start the contentment challenge. I have attempted Nancy Ray's contentment challenge a couple of times, but my lack of self control has always won over. 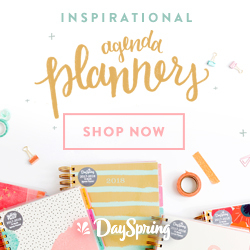 I want to curb my spending and replace my habits with something productive and positive. 6. Read 3 books. I have a large pile of books piled in my living room to read this year, and this month I have Longbourn, Making Things Happen, and Seven on the top of my list. 7. Prep weekday meals at home. I've done the grocery shopping for this month already and have made it a goal to prep and pack lunches Monday through Friday. Eating out is to be saved for special occasions and weekends. 8. Complete January's project life pages. Scrapbooking has been a hobby of mine since middle school; hopefully I'll find a few spare hours this month to dive in. I keep my tending list in the kitchen where I can see these goals daily, as well as my weekly and daily check points. Drinking more water, spending time in the Word, and getting active are top priority, as well as taking time to rest and refresh. I am starting to make more time for self care, something I put aside far too often. February is the start of a meaningful year lived on purpose. I choose joy. I choose peace. I choose to take the small steps toward my big dreams. Let's make it happen, y'all. I've known about the Bible for as long as I can remember. My parents were my Sunday school teachers when I was barely old enough to attend school during the week. I don't remember felt boards with Noah and his ark or what prints hung on the wall. However I do remember sword drills (races to see who could find a particular Bible verse the fastest) and memorization days. 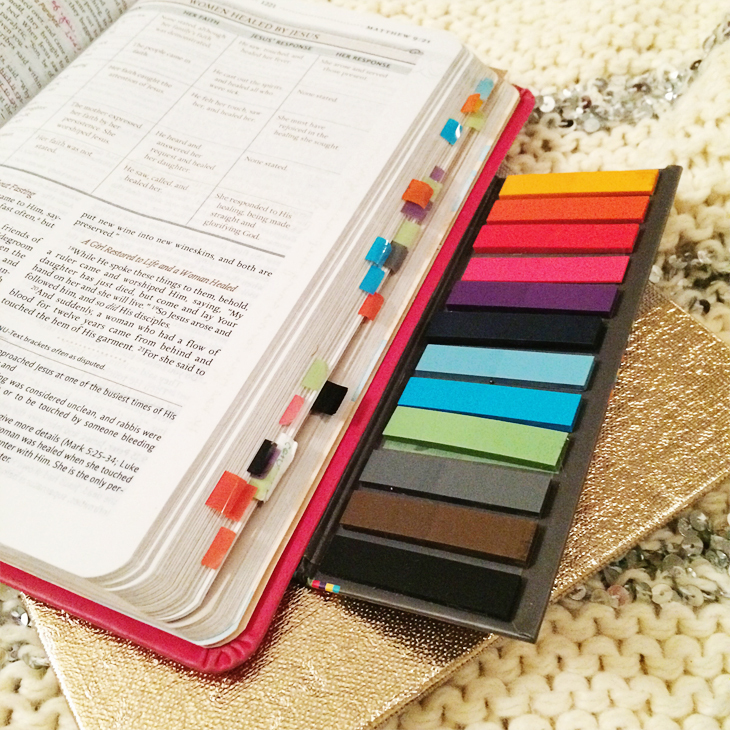 I could spit a dozen scriptures out to you before you could blink, and I was proud of it, too. But it wasn't until years later that the Word started to mean something more. And I'm talking around ten years later. 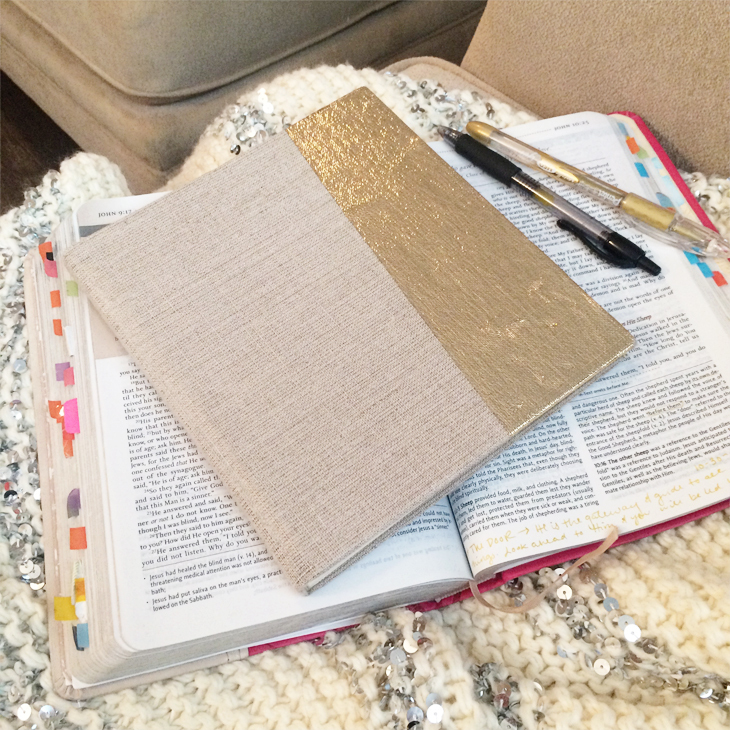 When I made my 2015 goals, the first on my list was to "live saturated in scripture." But I didn't want to do it alone. The Word of God is started to come alive for me when I read it in community. 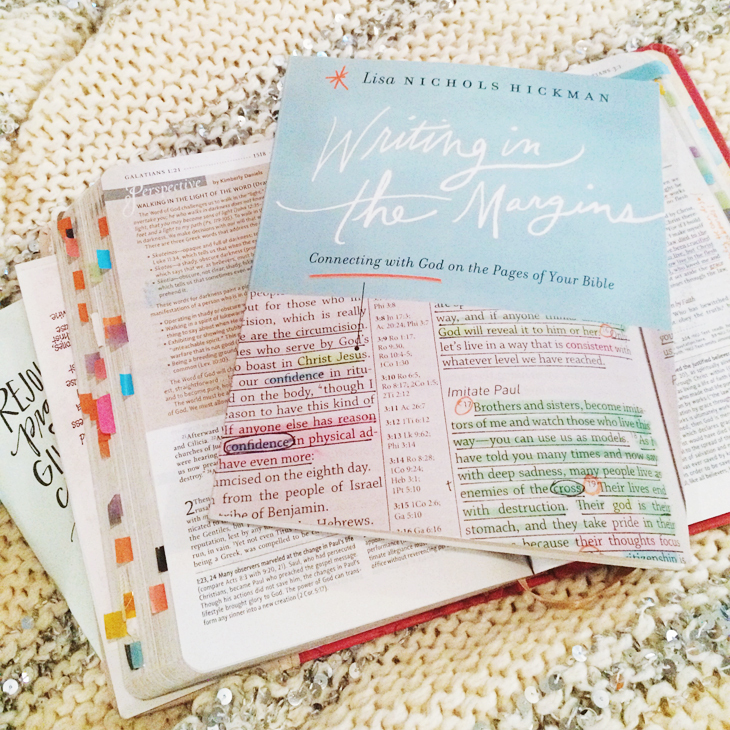 Diving in verse after verse with other college students and learning from other women through hashtags and online studies radically shaped my view of both the Bible and the way God works in our lives. From that place Heart of the Word was born. 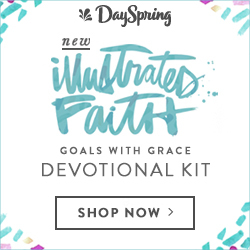 Beginning today, I am joining with fellow bloggers and soul sisters to study the Word intentionally and in community, and we are inviting you to join in! The kind-hearted and encouraging Rachel of Rachel Rewritten, Katie of A Place to Dwell, Rachel of Our Yellow Door, and Sarah of Joyfully Organized are co-hosting the series with me and will be sharing their hearts, insights, and routines along the way. This month we are beginning with the book of Ephesians. 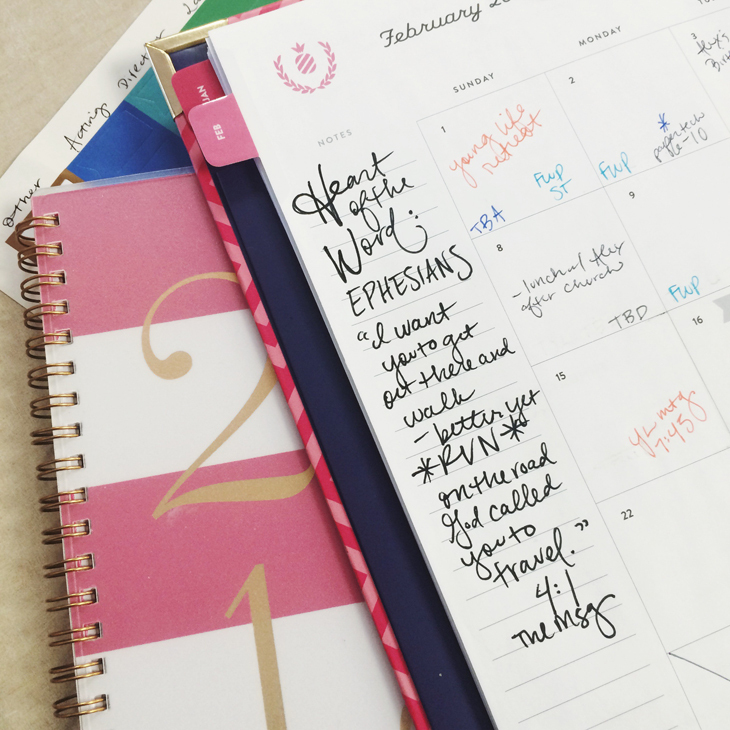 Ephesians is a letter of encouragement and advice, written to remind believers of our immeasurable blessings in Jesus, teaching us not only to be thankful for them, but to live in a manner worthy of them. Paul reminds us that the church is not confined to four walls, that the church is HIS people, every race and every nation, people who love Christ and want to spend their days serving Him. 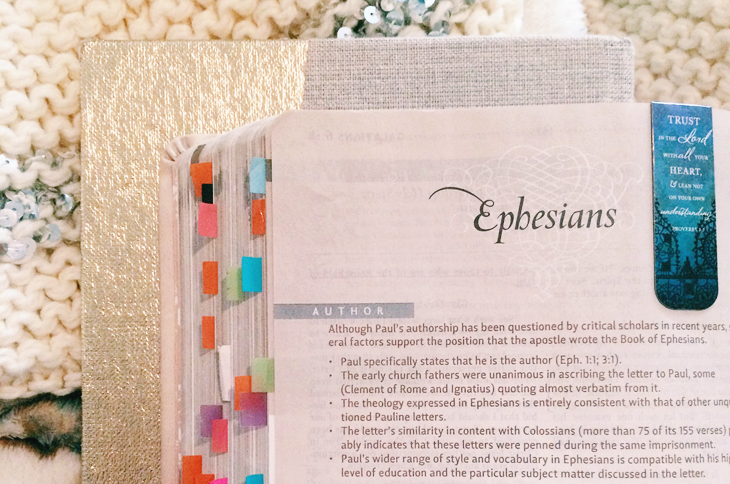 Ephesians is all about having Christ at the center. That's what I want to cultivate in this season and every season after it. Whatever road or calling I am to walk, it's Him I want to run with. And I want to run it with like-minded people. Our heart behind this study, and any that will follow, is to simply dive into scripture together. We will follow along and encourage one another by using the hashtags #heartoftheWord and #heartofEphesians, and we will offer weekly opportunities to link up with participants, sharing what the Lord is teaching you during this journey. None of this is required, though we believe that engaging with the Word with other women can only encourage us further. If you're interested in a weekly e-mail with updates, sources, reading suggestions, etc. sign up HERE. We have come up with a calendar for anyone who may want structure, but feel free to study it with your own system. I will be following the breakdown provided below in an effort to spend more time on smaller sections of scripture. Below is also a list of which blog to link to on our weekly link-ups which will take place each Thursday. The readings are roughly two chapters per week, and we added a Psalm for the third week to open our reading to more of the Bible. I've thrown a lot at you already, but below are two more items of interest. The first is the blog button you are welcome to put on your sidebar or weekly posts, share on social media, resize as needed, to spread the word. All are welcome and the more the merrier! Second, there is a link-up below for anyone who is interested in participating. Simply link to your blog's home page or about me so we can get to know one another better. I am so excited to dive in with all of you! If you have any questions, don't hesitate to ask!